Air Fryers vs. Deep Fryers: Which Appliance Is Right for You? Fried foods have been a part of human culture for centuries. Frying is a quick and easy method of cooking meats, vegetables, and breads – and it is tasty, too. Deep frying in particular – completely submerging foods in oil heated between 350 and 375 degrees Fahrenheit – became popular in America during the past two centuries. Delight in this comfort food flavor quickly spread around the world. The first “domestic” or home use deep fryers hit the market during the 1970s. Two decades later, a new challenger arrived on the scene – the air fryer. While air frying does not “fry” the food in the traditional sense, it does achieve similar results. This is due to chemical reactions in the food. Both cooking methods dehydrate the food’s surface and produce a Maillard reaction – breaking down proteins and sugars to produce a crisp exterior and decadent “fried” flavor. We will consider how both air fryers and deep fryers work and compare their performance so that you can make an informed decision as to which appliance is right for you. 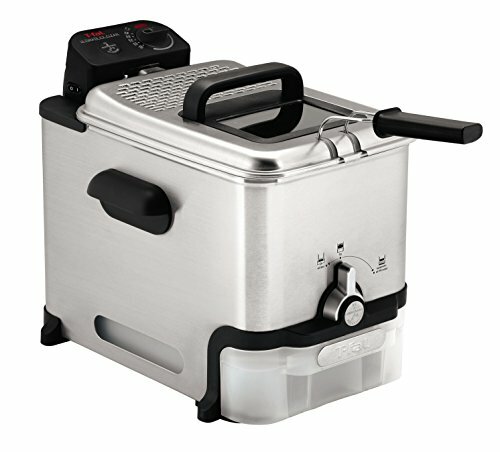 Deep Fryers - How They Work? Is an Air Fryer Healthier Than a Deep Fryer? 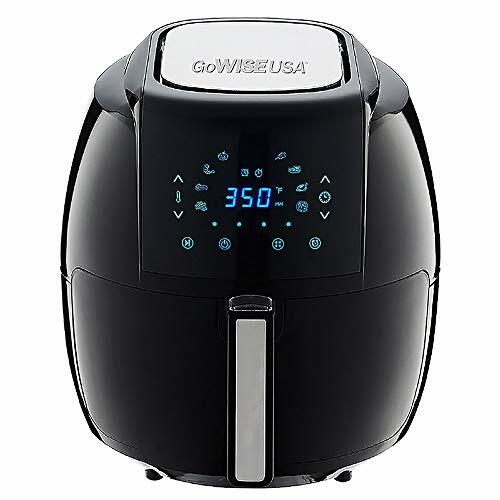 Can an Air Fryer Replace a Deep Fryer? Find out how air fryers and deep fryers make your favorite foods taste delicious. Air fryers are small kitchen appliances that generally occupy one square foot of counter space. They are known for reducing cooking times, conserving energy, and producing crispy foods that are soft and juicy on the inside. Air fryers work on the principle of convection. A heating element within the device superheats the air. In addition to natural air movement due to convection currents, the air is circulated by a fan. This movement of air aids in heat conduction to the food, reducing cooking times and mimicking the high intensity of deep frying. Food is placed in the frying basket, which has perforations to allow the free flow of air. Air fryers are considered a healthier alternative to fried foods because they use much less oil or no oil at all. Food can be tossed in a small amount of oil – generally a few tablespoons or less – to aid the air frying process. The basket may be removed and the food shaken or turned during the cooking cycle to ensure even heating and maximum crispiness. Deep Fryers – How They Work? Deep fryers employ oil that has been heated to 350 to 375 degrees Fahrenheit to quickly cook food. When the food is submerged in the oil, the surface of the food, especially if breaded, dehydrates and browns, forming a crust. Potatoes will crust without added breading due to their high starch content. This crust prevents the food from becoming saturated with oil. At the same time, the intense heat denatures proteins, gelatinizes starches, and softens dietary fiber within the food. This is the reason for the “fried” texture that is so beloved. A cooking basket is used to lower the food into the oil and safely remove the food after cooking. Deep fryers for household use may require between two cups and six liters of cooking oil. Oil can typically be reused for a limited amount of time. Some deep fryers employ filters to extend the life of the oil and reduce cooking odors. Which of these appliances will be the best fit for you, your family, and your lifestyle? Consider how the deep fryer and air fryer compare in the following categories. Am I looking for a true deep fried flavor? How much space do I have in my kitchen? Is healthy eating of the utmost importance? Which option is safer for my family, including children and pets? Is easy cleanup important to me? 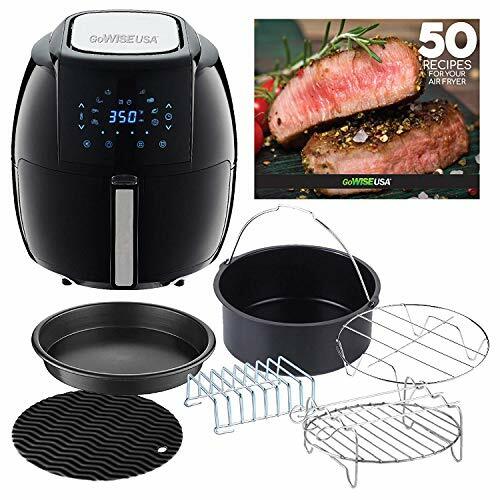 As previously discussed, the air fryer and the deep fryer are designed to achieve the same goal – to cook food quickly and to produce a crispy, golden brown exterior and juicy interior thanks to the science of the Maillard reaction. The difference lies in the cooking medium – one uses air, the other, oil. Air fryers cook food using hot air that is circulated within the appliance by means of fans and naturally occurring convection currents. Deep fryers, on the other hand, submerge food in hot oil. In both cases, cooking temperatures typically range from 350 to 375 degrees Fahrenheit (air fryers have a slightly wider temperature range). The average footprint for both air fryers and deep fryers is approximately 1 square foot. Most models of each type of appliance are 16 to 18 inches or less in height, allowing them to fit easily beneath most kitchen cabinets. Larger models of each type of appliance are also available. If counter space is limited, compact air fryers and deep fryers are available. For example, the Dash air fryer and Oster compact deep fryer each have a footprint of approximately 8 by 11 inches. 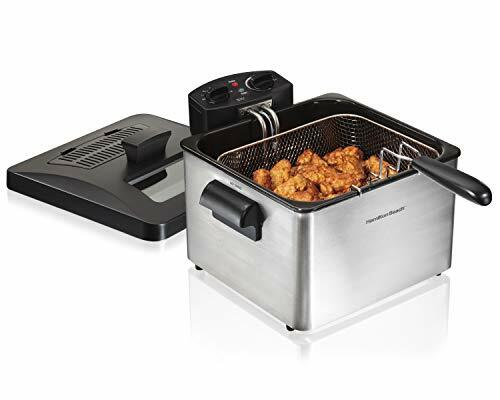 Winner: In terms of size and space requirements, both the air fryer and the deep fryer tie for first place. Both are small enough to inhabit most kitchen counter environments. Fried foods are considered comfort foods the world over. Deep fried foods such as fried chicken and, more recently, deep fried oreos, twinkies, and candy bars were born in the American south. Deep fried favorites such as kushikatsu (breaded meats and vegetables), tempura (vegetables and seafood in a special batter), and tonkatsu (pork) arose independently in Japan. Fast food chains pair French fries with nearly every entre. These and other recipes have spread across the globe. The cooking method – namely, deep frying – used to produce these dishes is unique. Technically, only deep frying can produce the exact results – the characteristic texture and flavor – that make fried foods so cravable. One of the chief complaints against air fryers is that the results aren’t exactly like traditionally fried foods. This is true. Air fryers can produce similar textures and flavors, but there will be noticeable differences. Many people consider air fried foods a good alternative to traditional frying because the use of less oil makes the dish more heart healthy and decreases the food’s calorie content. Winner: Only a deep fryer can achieve a “true” deep fried taste and texture. However, air fried food is still a really tasty option with much fewer calories. Depending on the model and recipe being used, some air fryers require preheating. Deep fryers will always require the oil to be preheated prior to contact with food. A major point of divergence is in the use of oil in and the safety features of each appliance. For air frying, the food may be tossed in a small amount of oil, and tossed or turned once or twice during cooking. As the air fryer is completely enclosed, there is no risk of burns from hot oil splatters during cooking. The outside of the appliance is fitted with a heat resistant housing; many are advertised as “cool touch.” Risk of burns typically only occurs when the frying basket and the hot food it contains are removed from the appliance. Care must be taken when lowering food into the deep fryer or when removing it, as hot oil can “pop” from contact with the food and burn the hands – especially if the food is moist. Many, but not all, deep fryers have a cover that prevents grease splatters during cooking. The metal exterior of some deep fryers can become hot enough to cause burns. Care must also be taken to ensure that the oil has cooled completely before moving, emptying, or cleaning the deep fryer. Winner: The air fryer wins in terms of ease of use due to its safer nature. It is also easy in terms of cleanup, which we will discuss next. Air fryers are designed for easy cleanup. The interior of the oven, the frying basket, and many accessories are covered in a non-toxic, non-stick coating. The basket, racks, and accessories are generally dishwasher safe. The fryer itself can be cleaned using a damp cloth. To clean a deep fryer, you must remove the oil. Make sure that the fryer is completely cooled before you begin. Unplug the fryer and remove the oil. If discarding the oil, remember that you should never pour it down the sink or any other drain. Over time, the solidified oil will coat and clog the pipes. Place the oil in a container and dispose of it in the trash instead. Next, hand wash the fryer using soap, water, and a soft cloth. Rinse thoroughly, and dry the fryer completely. Excess moisture left in any part of the fryer can cause the grease to pop and splatter the next time you use it. Typically, only the removable fry basket of the deep fryer is dishwasher safe. Winner: With its dishwasher safe, non-stick components, the air fryer cleans up in the category of easy cleanup. The air fryer dominates in two out of our four categories, and ties with the deep fryer in a third. Health experts may tout the benefits of not frying foods, but here we will discuss the benefits of two types of frying. Yes, frying has its benefits! Consider what air frying and deep frying can do for you. Health benefits. Air frying uses 70 percent to 100 percent less oil when compared to deep frying. Less oil is absorbed into the food, so your same favorites have less calories. This can help you to lose weight or maintain a healthy weight when combined with an active lifestyle. Some doctors recommend lowering the intake of certain oils to support heart health. Easy cleanup. The frying basket, racks, and accessories of most air fryers are non-stick and dishwasher safe. You will also avoid the lingering food odors associated with deep frying. Increased safety. The outside of your air fryer is designed to be cool to the touch. There is also no vat of hot oil that could be overturned by children, pets, or even yourself, potentially causing severe burns. Vegetable antioxidants. An article published in the scientific journal Food Chemistry in 2015 suggested that vegetables fried in extra virgin olive oil had increased levels of certain antioxidants compared to the same vegetables boiled in water or eaten raw. Comfort food. When you are craving deep-fried flavor, only deep frying will do. Be sure to eat fried foods in moderation. A crowd pleaser. Not only will the occasional deep-fried treats be a comfort to you, but to your friends as well. You’ll be able to prepare restaurant-style dishes when you entertain. Who doesn’t love fried chicken wings on game day, or a little pub food on poker night? Despite a few reports on the benefits of frying vegetables in extra virgin olive oil, deep-fried foods are generally considered unhealthy. Why? Consuming the wrong types of oil or too much oil can increase your risk for heart disease, high cholesterol, and obesity. If the oil has been heated beyond its smoke point, chemical components within it can break down into harmful free radicals. Finally, oil absorption increases the calorie content of food by 30 to 50 percent. When you “fry” food using an air fryer, you need only a thin layer of oil – or none at all, depending on the recipe. You can use an oil mister to improve the outcome of battered foods. Use it on just about any food to increase its crispiness. Choose extra virgin olive oil, coconut oil, avocado oil, grapeseed oil, or other cold-pressed oils known for their health benefits. If you are counting calories or combating certain health conditions, air frying is a healthier alternative to deep frying. It can help you satisfy your fried food cravings without the potential downsides of fried foods. If using an air fryer, have realistic expectations. Your French fries won’t taste just like McDonald’s, and your wings won’t be as crispy as at Wingstop (even a household deep fryer might not produce restaurant quality results). They will be good, however; you’ll have a hard time not devouring them. You’ll also be able to enjoy premade frozen foods, such as chicken tenders, breakfast dishes, and taquitos like never before. In short, no, an air fryer cannot replace a deep fryer. It is, however, a healthier alternative to deep frying that produces similar but not identical results. In terms of flavor, most foods taste just as good if not better when prepared in an air fryer. 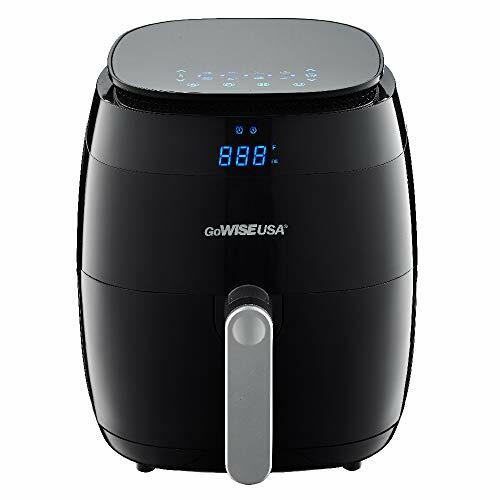 An air fryer can also be used to cook any food that you would normally cook in a deep fryer.